Spinning melt pump, also called melt spinning pumps, used on the extruder for spinning products, and it can improve the quality of products by boosting and stabilizing pressure of the melt. 2.Reduced temperature variations in the melt. 1.Spinning melt pumps are widely used in fiber extrusion. Such as: Acrylic - polyacrylonitrile, Spandex - Polyurethane, PP - Polypropylene PP, Polyester - Polyester PET, Nylon-PA PA6 PA66 2.PA1010 PA11 PA12, PVA - Vinylon. 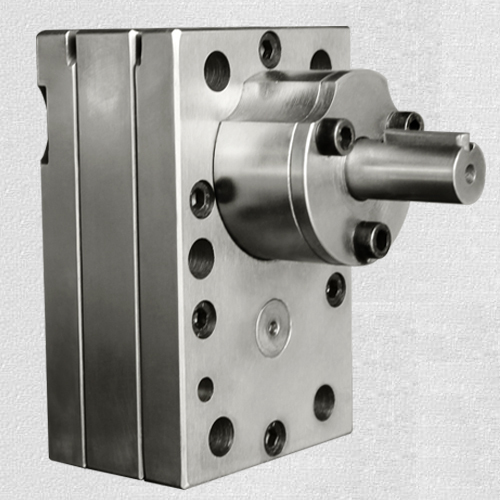 As a melt pump manufacturer, Batte has a unique positive displacement design which provides consistent, accurate plastic delivery under varying extruder output conditions of pressure, temperature and viscosity. With Batte Melt Pump providing the pressure between the extruder and the die, extruder parameters can be configured to provide a homogeneous melt at increased throughout and tighter gauge tolerances.